These hex head bolts are made from stainless steel. Available in 304 (A2) or 316 (A4) grades. 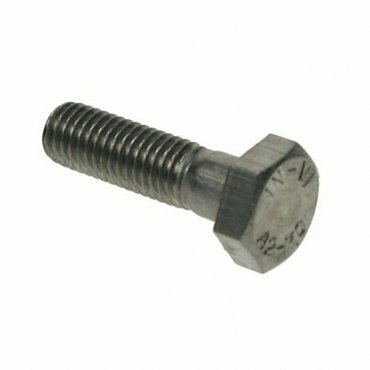 The bolts are part threaded and conform to DIN933 standards. The hexagonal head has been designed for use with spanners or sockets and offers maximum torque when used with these tools. For fastening together numerous types of material or to be fastened into pre-tapped holes. Widely used in many engineering applications. Stainless steel does not readily corrode, rust or stain with water as ordinary steel does. However, it is not fully stain-proof in low-oxygen, high salinity, or poor air-circulation environments. There are different grades and surface finishes of stainless steel to suit the environment the alloy must endure. Stainless steel is used where both the properties or steel and corrosion resistance are required.